About once a month, I make a roast chicken dinner, using Julia Child's Roast Chicken recipe. It always turns out beautifully, and the cooking time is based on a formula. There is a base cooking time of 45 minutes, plus 7 minutes per pound. 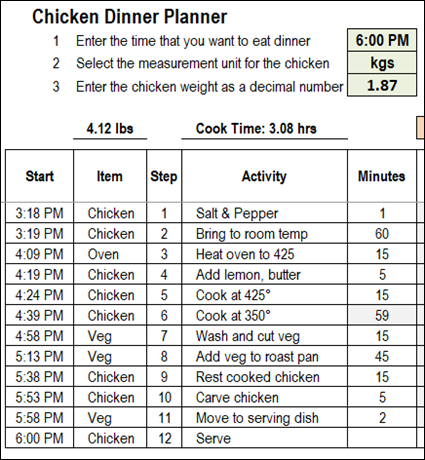 To make it easier to calculate the cooking times, I've created this Excel Chicken Dinner Planner that you can download. 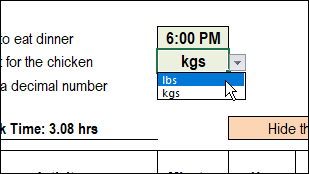 Just enter the meal time and chicken weight, and let Excel calculate the time to start each step. 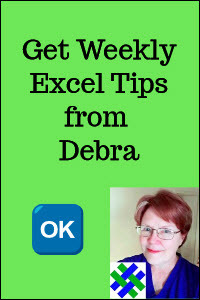 Or, use the interactive Excel file below, if your browser supports that feature. NOTE: If you don't have a copy of Julia Child's cookbook - Mastering the Art of French Cooking (Vol. 1) - there is an online recipe that you can follow, on the Nom Nom Paleo site. The first step is to enter the time when you want to have your chicken dinner. Go to the DinnerPlan sheet, and type a meal time in cell F3. There is Data Validation on the cell, which only allows valid times to be entered. Next, choose a measurement type from the drop down list in cell F4. Then, type the chicken's weight in cell F5, as a decimal number. The cell has Data Validation rule, which only allows Decimal numbers, greater than zero. 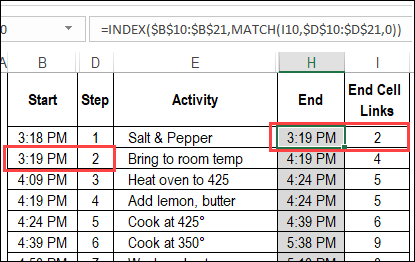 After you enter the meal information in the 3 green cells on the DinnerPlan sheet, Excel shows the steps with their start times. 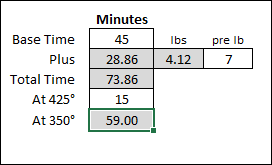 After the 3 green cells at the top have been filled in, Excel calculates the start time for each step. Then, you can print the steps schedule, and take it to the kitchen. To calculate the cooking times, there are formulas on the Calcs sheet. These are based on Julia Child's formula -- a base cooking time of 45 minutes, plus 7 minutes per pound. In cell D8, a formula converts a kilogram weight to pounds, if necessary, or uses the weight that was entered as pounds. In cell C10, the minutes at 425° is typed. Julia Child says to cook the chicken at that temperature for 15 minutes. 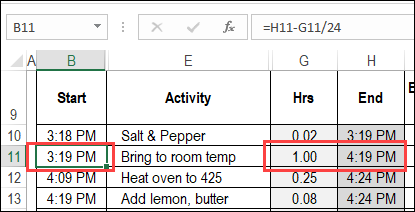 The 350° cooking time is referenced on the DinnerPlan sheet, in cell F15. All of the other minutes in the DinnerPlan "Minutes" column have been typed in, because they won't change. 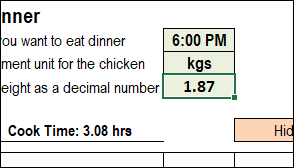 To calculate the start and end time for each step there are formulas on the DinnerPlan sheet. All the times work backwards from the meal time that you entered in cell F3 (DinnerTime). The calculations figure out when each step must end, in order to get the meal on the table by that Meal Time deadline. Each start time (except the final one), is calculated from the step's end time. Next, in column I, a step number is typed in each row. This is the step number for the step that starts when the current step ends. Some steps can be started before the previous step is completed, so this column gives us better control over the timing. For example, we can start step #3 (heat oven to 425°) before step #2(bring to room temp) is completed. So, the End Cell Link for step 3 is "4" -- the lemon should go into the chicken after it is at room temperature. 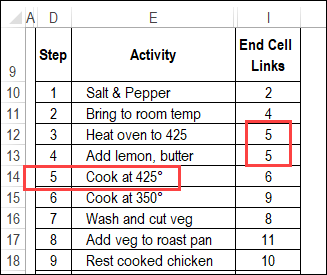 In some cases, multiple steps have the same End Cell Link -- both step 3 and step for are linked to step 5.
before the "Cook at 425°" step can start. In column H, there is an INDEX and MATCH formula that gets the value from the Start cell that is entered in the End Cell Links cell. 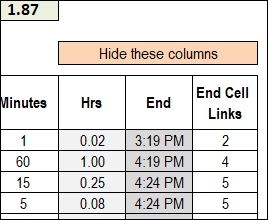 In column B, the last Start Time, in cell B21, is linked to cell F3 (DinnerTime), where you entered your meal time. the step takes 1 hour. The formula result is 3:19 PM. 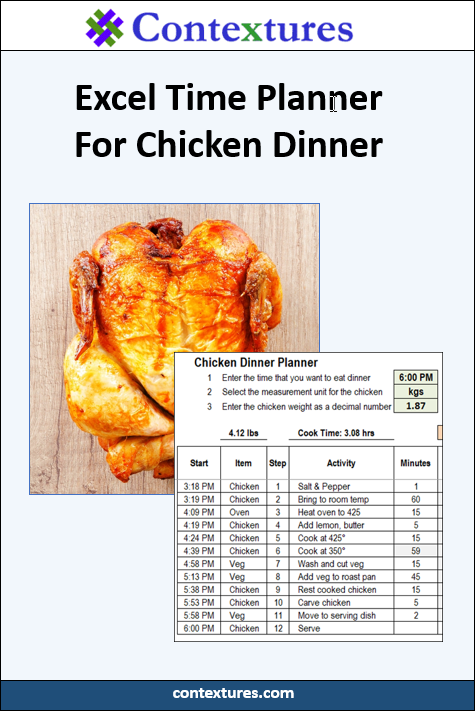 If your browser supports it, try the Chicken Dinner planner in this embedded Excel workbook. In the green cells at the top of the DinnerPlan sheet, enter your Meal Time, Measurement Unit and Weight, to see when each step starts. Download a copy of the free Chicken Dinner Planner. The zipped file is in xlsx format, and does not contain any macros.